I am not here to tell you that you are all basic betches who only drink Starbucks coffee. In fact, I am one of you basic betches who only drinks Starbucks coffee. But during my time at UM, I have discovered my love for Cuban coffee (shout out to the Federation of Cuban Students who always serves it on The Rock). Cuban coffee is awesome. It is all the caffeine you need to start your day in a little shot. However, while it is easy to take one, it is also easy to take one too many because it is sweet and warm and delicious. Like your tequila tolerance, know your Cuban coffee tolerance. Having more than enough will have you bouncing off the walls in your three-hour Thursday night lecture. 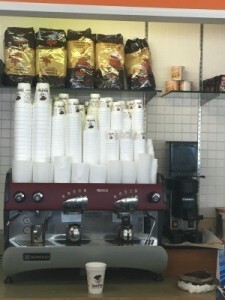 Cuban coffee’s influence is apparent throughout Miami as shown through the multitude of cafes in the area. I have heard about great Cuban coffee places, but now that I finally have my own set of wheels, I can actually go out and get it myself. Even so, I never have because I don’t know the Cuban coffee lingo and didn’t want to be the stupid girl holding up the line because she didn’t know how to order a cup of coffee. But the truth is, it’s really not any harder than ordering a venti iced skinny vanilla latte with almond milk and two shots of espresso. Don Pan, a Latin bakery, has been in the Miami area since 1995. Today, the Venezuelan bakery serves all forms of coffee and pastries for the surrounding community. 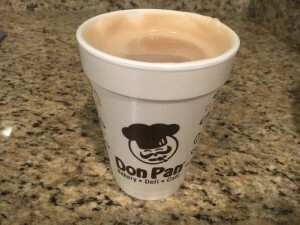 Don Pan offers all of the Cuban coffee staples: cafecito, colada, café con leche and cortadito. Let’s break it down. Cafecito is a tiny, yet strong dose of coffee that is served in a small cup. It can be taken all at once like a shot, or sipped slowly to savor the deliciousness. Colada is meant for sharing. It is served in a larger cup and comes with the smaller cafecito cups. Don’t worry, we won’t tell if you drink it all by yourself. 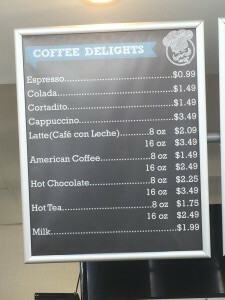 A cortadito is essentially a Cuban coffee with a few tablespoons of milk, like a small cafe con leche. In case you’re a beginner, this is a good start before going onto the stronger stuff. Made with hot, steamed milk and a shot of Cuban coffee, café con leche is the equivalent of a latte in America. Cortadito is essentially a miniature café con leche, as it is Cuban coffee mixed with a few tablespoons of milk. I have had cafecito many times, so I went with a café con leche. It was everything a latte should be: light and sweet, but not too sweet as they sometimes can be. Don’t get me wrong, I will absolutely be hitting up Starbucks from time to time now that it’s pumpkin spice latte szn, but Cuban coffee definitely now has my heart.